Price discovery is an opaque process in real estate markets: nobody has an incentive to show real paid prices, sellers and buyers for obvious reasons and agents because they can retain more control on the market by keeping perspective buyers and sellers unaware of real market prices. In countries like the Dominican Republic there are no official statistics of home values and trasparency is very low, there is much hearsay and little evidence in market growth rates touted by agents and realtors. Sosua makes no exception, there is little or no price history and no information available to the public. How confident can a perspective buyer be of listed house prices? Is there margin for negotiation? Are listed prices fair prices reflecting real demand and supply dynamics? Only few insiders can anser to these questions and under these conditions is very difficult to evaluate a real estate investment. At Sosua RE we believe that it is in the best interest of the whole real estate market to have more information on prices: with a more transparent pricing information insiders margins would be lower but both buyers and sellers would be able to make their investment decisions in a more informed and more confident way : we believe that this would definitly increase the number of deals. For these reasons at Sosua RE we have decided to create and publish the first Index of Real Estate Prices in Sosua . First we have collected all the information available through past and presents property listings, from surveys , present and past records and by analysing these data we have developed an econometric model which includes information on Puerto Plata airport arrivals, on the construction sector revenues and costs. Then we have applied our statistical model to the Sosua real estate market in order to find the best price estimates for periods with little on no records on prices paid and home values. By so doing we have created a synthetic time series with montly data on house prices going back to the early nineties. We have published here a chart with the monthly historical time serie of house prices (USD per square meter) of new single family homes with three bedrooms, good finishes and fixtures and standard garden size. How to read this data? Our data are statistically inferred , not actual market data: every home is different, there are homes with better fixtures, better view, better location which demand a premium in their valuation, other homes may be less attractive and can be offered at discount for several reason….we have tried to create a standard home with standard features (new single family homes with three bedrooms, good finishes and fixtures and standard garden size) and the data shown in the chart below show the historical prices of such home going back to 1992. To add some robustness to our historical time series of real estate prices we have added to the chart the historical time series of the construction costs using official statistics on price inputs: this way it is possible to see prices (home values) and costs (construction costs) in the same chart. The Sosua real estate prices of our historical time series are quoted in USD per square meter because in the Sosua real estate market the currency used is the USD and most of the buyers of residential condos and vilals are foreigners. We also have a database with these series in Pesos, with prices per square feet, with prices for condos and other type of property. To our knowledge there is no other instrument available like our Sosua Real Estate Price Index: we are happy to share its basic information for the benefit of the whole market and we will be glad to assist our customers with more in depth information and analysis. 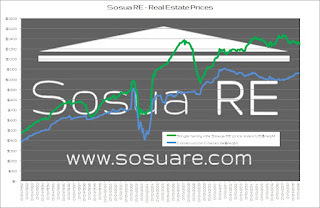 Sosua Real Estate Index latest release (December 2018), data, analysis and charts.